With over 45 years in the concrete industry, we at Callahan Concrete know that pouring concrete requires not only hard labor, but also quality concrete products. After years of pouring concrete, we have come to understand and appreciate the value of excellent customer service from a ready mix plant. We apply this understanding to our current operations and strive to provide residential, commercial and government contractors in the Lexington, NC, area with exceptional ready mix products and services. As an NC DOT certified company with NC certified batch technicians and superior products and equipment, we can fulfill all of your residential and commercial ready mix concrete needs. Call today for more information about our ready mix concrete products and services. Call today to speak with an experienced, certified concrete batch technician about the concrete products you need to complete your residential or commercial concrete project. Having been in the concrete industry since 1969, we know just how demanding concrete work can be. While we are no longer in the business of finishing concrete, we are connected with many local contractors who are. 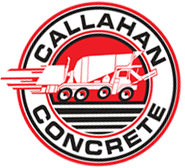 Call Callahan Concrete today for all of your concrete product order and delivery needs and be sure to ask us about local contractors who can handle the labor for you. Copyright © 2019 CALLAHAN CONCRETE, all rights reserved.